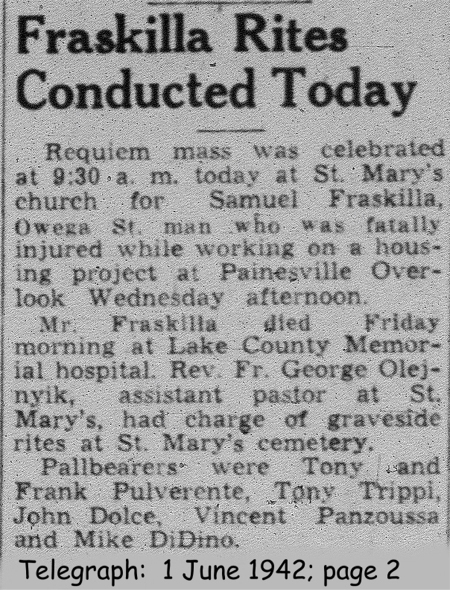 Salvatore Fraschilla first appears at Painesville, Lake County, Ohio, in 1941. He had previously lived in Wickliffe, Ohio, for many years. In America, Salvatore Fraschilla was known Sam Frasckilla. Salvatore Fraschilla, son of Antonio Fraschilla and Maria Pulvirenti, was born on Tuesday, September 23, 1884, at Ragusa, Sicily. Salvatore married Lena Fraschilla about 1910. Lena Fraschilla was born at Ohio. Salvatore died on May 29, 1942, at Lake County Memorial Hospital, Painesville, Lake County, Ohio, at age 57. He passed away due to injuries he suffered when trapped in a cave-in at Painesville Overlook in a home construction project. He was working in a trench when one wall gave way trapping and crushing him. His body was interred at Saint Mary Cemetery at Painesville Township, Lake County, Ohio. Salvatore Fraschilla first immigrated to the United States on March 27, 1907, at age 22, travelling to New York City. He was joining his brother Francesco Fraschilla in New York City. Salvatore Fraschilla is cited on a passenger ship manifest re-entering to the United States on June 21, 1911, at age 26, travelling to New York City; he was returning to New York City. At the time of death, Salvatore resided at 337 Owego Street, Painesville, Lake County, Ohio.